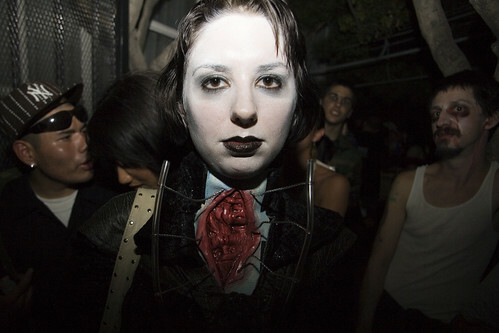 Halloween How-Tos | Dapper Cadaver Blog » Gothic, Horror & Halloween! The first scenario guests come to in the Haunted House will be a fortune tellers parlor. 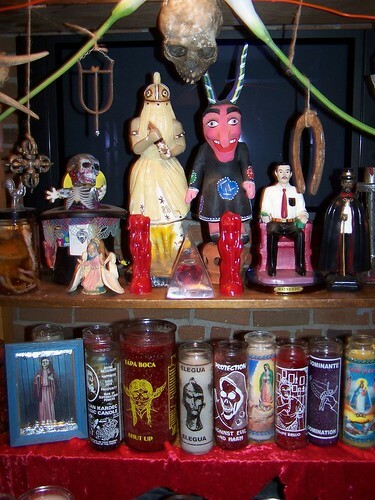 Décor includes occult oddities such as the mystic hand, the hand of glory, phrenology head, fetal skeleton, cat skeleton, human skulls, Indonesian devils, the bust of a mourning widow and a severe bearded man, and several haunted portraits, whose vintage characters transform into ghosts and ghouls as people pass by. At the center table sits an actual fortune teller who welcomes guests, tells fortunes throughout the night, and tells the tale of the evenings cursed surroundings. The glowing light of plasma balls illuminates the room. An anamatronic fortune teller can be set up as well. Inside the house is the scene of the horror, the room where the young baron tortured his victims. Hanging from the ceiling are several gibbet cages with spotlights pointed at them to cast an eerie criss-cross of shadows. Hooks and chains also hang from the walls and ceilings. The furniture all has chains and shackles coming off of it to hold victims in place. In the rafters hang ghosts of all sizes, large skull headed ghosts, medium ghosts with arms, and small ghosts that are little more than shrouded heads. Cobweb covered heads, screaming heads and reaching hands are coming out of the walls. Around the floor are gothic iron candelabras and on each table are prop bones, skulls, ribcages, and table top candelabras. A bloody ax hangs behind the bar, which has been outfitted with blacklights. The specialty of the house? Ectoplasm gin fizzes and Ectoplasm vodka fizzes. The drinks glow neon blue in the blacklight. Use tonic water in a vintage bottle or with a homemade label marked ectoplasm. The quinine in tonic water is the only food that naturally glows under blacklight. A cobweb covered skeleton in a bartenders uniform stands behind the bar. Another sits on a barstool, passed out drunk, his glass turned sideways and rubber blood leaking out. Behind the bar amidst the bottles are human body parts suspended in jars of glowing fluid and skulls that seem to float in the air. Torture equipment such as guillotines, interrogation chairs and stocks are set up so guests can have their last photos taken screaming in pain. Everything in the main room is covered in cobwebs. Blood drips in the bathroom, and patrons find they often leave with blood on their hands, a trick done by powdering various items with magic blood powder, which looks invisible but turns to blood when wet. The floor is littered with skull piles and lights flicker in the fog. A ghoulish butler stands guard, watching, breathing, laughing. Bat demons fly above. 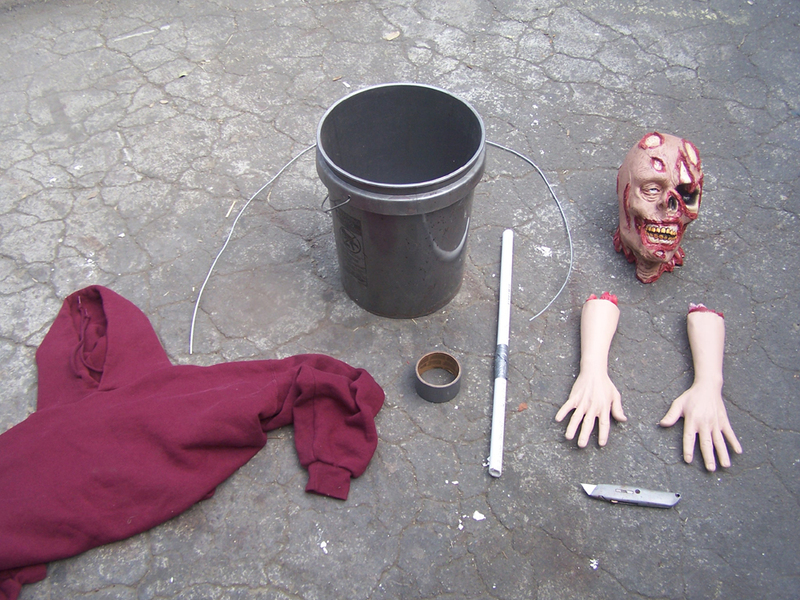 The following are some of the suggestions we give anyone setting up a Halloween Party or Haunted House. Props we can provide are linked. 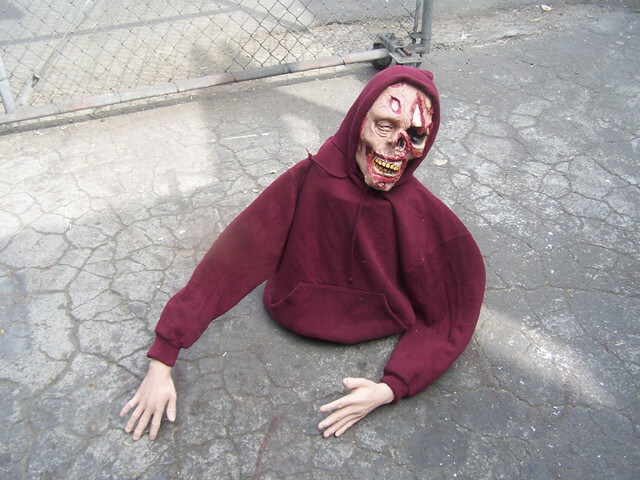 All Halloween props are available for sale or rental. 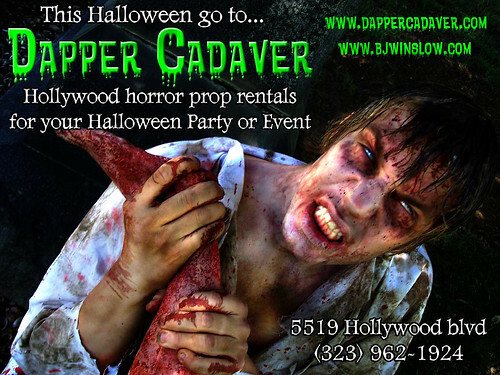 Email BJ at BJ@Dapppercadaver.com for a quote or more Haunt scenarios and suggestions. 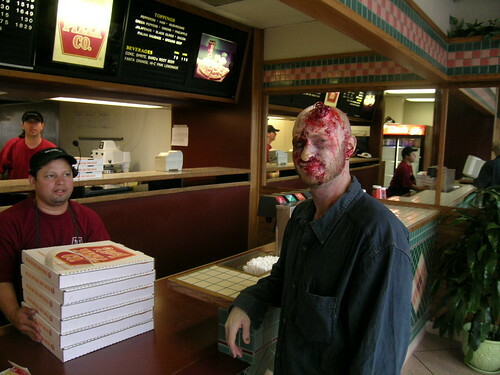 Note the importance of actors, timing, drama, and atmosphere as well as props and effects. Be sure to add eerie lighting and sounds! 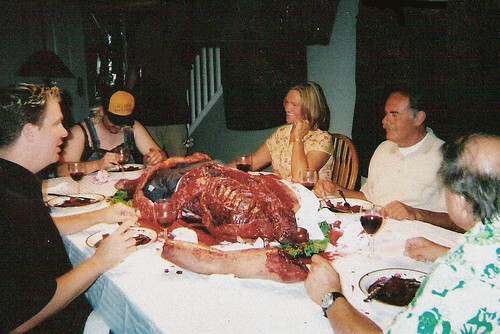 A long table is set with piles of bloody body parts and partial human corpses. Gothic tabletop candelabras sit on the table and 5 foot tall floor candelabras are around the sides. On the walls are hung changing portraits, grotesque taxidermy and bloody curtains. A vulture perches on one chair, a decomposed skeleton in another. Platters are covered in small bits, eyes, fingers, tongues. Other plates are piled with intestines, hearts and livers. 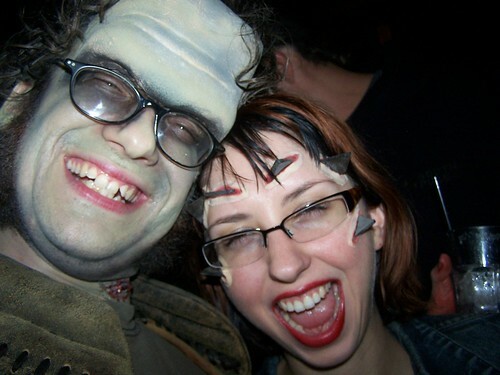 Two actors sit at the table in costume feasting on edible brains, hands, hearts, and faces, instead of silverware they use dissection instruments. Another actor or animatronic is on the table moving and screaming. The butcher is an actor in a long white butchers coat with a black butchers apron over top. His apron is strung with a variety of wicked looking steel autopsy instruments. In his hands he has a real chainsaw which still works, but the chain has been removed so it cannot cut. Hanging in chains from the ceiling are several hooks, skinned animals, a half pig, a skinned goat, a half person, a skinned person, a full corpse, and several human limbs. The walls are hung with blood splattered plastic curtains. On a chopping block is a meat grinder with a human hand sticking out the top and ground beef coming out the front. 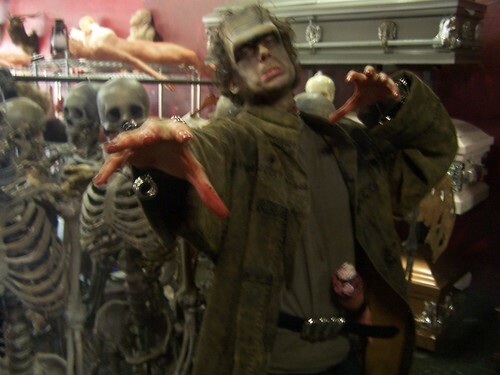 He menaces the crowd as actors behind the plastic curtains reach bloody hands out through slits and beg for help. A row of axes hangs on the wall. Animated heads rotate in torture boxes. A Mad Doctor experimenting on patients. The doctor is an actor in a long white lab coat. He holds a steel pistol syringe with a retractable fake needle and has a reflector on his head. Another actor is bound in chains and cuffs to a vintage insane asylum bed. An equally vintage autopsy pump sits beside the patient. Shelves around the scene hold several specimen jars which glow under blacklight. Also on the shelves are plasma balls flickering with lightning effects, human skulls, and the mounted skeletons and mummies of strange creatures. A full size 2 headed skeleton stands beside them. An IV bag filled with blacklight responsive fluid hangs from an IV stand. An large x ray light box covered in x rays glows in the background. Scene is a jungle with hut. 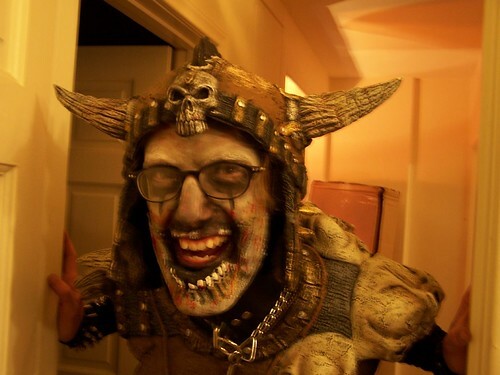 Head hunter is an actor with a headdress made of lightweight skulls and feathers. His necklace is a variety of small skulls and bones. He holds a large plastic machete and a spiked club. Shrunken heads, severed heads, chickens and skulls hang everywhere. Heads on stakes dot the background. Bright Indonesian devils sit on pedestals. In the foreground a charred body rotates on a spit. Scene is a graveyard, a few dozen tombstones rise from the ground, amid them a large angel, and 3 large obelisks stand. On the ground is an old wooden coffin, and a pile of dirt and a shovel. In the dirt several bones and body parts can be seen sticking out. A grave digger stands, with a steel bonesaw in his hands. His belt is strung with human hands, rotted hands, and skeletal hands all wearing gawdy jewelry. He opens the casket and inside is the mummy-like corpse of an old woman, decked out in pearls, gold and rings. This would be a good scene to work in an animatronic coffin popper. Grave digger can also interact with the crowd by trying to sell rings with the fingers still inside. Crows and vultures perch on the stones and in the trees. Rats are on the ground. Low lying fog creeps over everything. Moss hangs from everything. Most Gothic Weddings occur in the Fall, the closer to Halloween the better, but any time of the year can be ideal for a gothic wedding. It’s simply a matter of transforming the wedding and reception areas into something more extraordinary. To do that, nothing beats the right gothic wedding decorations. 1. Candelabras – If you’re getting married in a church, or better yet a cathedral or castle, candelabras may already be provided for you. If not finding appropriately gothic candelabras may be trickier then you think. Most party rental places stock white wedding type candelabras, light colors, pearl finishes, etc. They’re also not to keen on you painting their white candlesticks black. Two rental places that do carry black candleabras are BJ Winslow’s Prop Rentals in California and Events Rentals in Arkansas. Both places rent Candelabras at $15-$50 each as of the time this article was written. Winslow offers bulk discounts as well. 2. Flowers- Red roses work with everything, but how about black roses? No natuturally occuring black roses grow, but many floral shops can make them by dying white roses. Carnivourous plants might make an interesting choice, however most are delicate, prone to dying,sticky, or smelly to attract their prey. Alchemy Works has an excellent selection of dark flowers. COFFIN dead marilyn John Ganun, originally uploaded by Boju. When I was a kid I loved monster masks. Every Halloween I wanted to have the coolest scariest Halloween costume and mask, and when I was a kid masks were great because I could get a couple and hit the houses with the best candy over and over. As an adult though masks present some major problems. First you can’t drink. Second my glasses fog up. Third you can’t drink and Fourth it muffles your ability to talk. Solution? 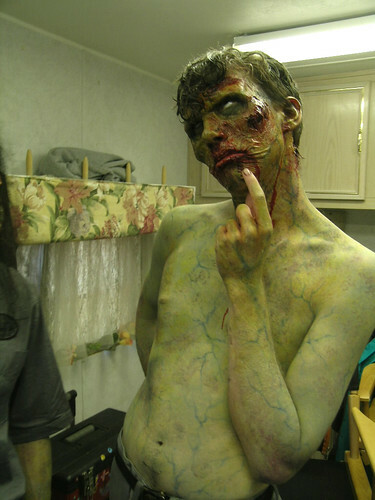 Ditch the mask and build a better creature with make up, prosthetics, contacts, and props. 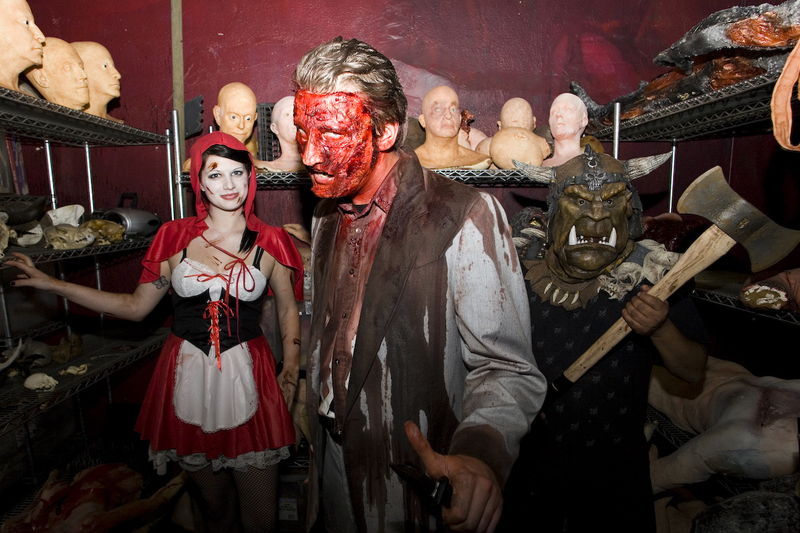 As the owner of the Halloween shop Dapper Cadaver I’m amazed at how many people are reluctant to do any make up but still buy masks. 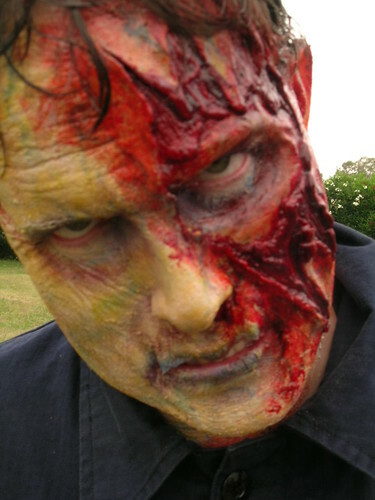 Believe me the mask is 100 times more unpleasant to wear then some prosthetics. 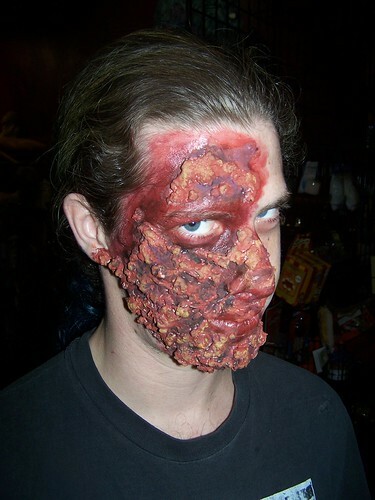 Plus, prosthetics transform your face without hiding it so you still look alive. 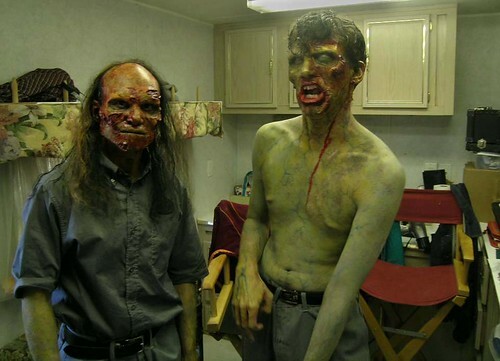 Then just add some creepy FX contact lenses like the kind they have at Lens Shopper and you go from an average joe to a creature from beyond. Be sure to order early, I don’t sell contact lenses and I can’t tell you how many people call me desperately in the 11th hour looking for some. halloween greetings, originally uploaded by Boju. Unlike a Haunted House, where the decor is the event, when decorating a Halloween party you’ve got the added challenge of needing to set up the normal party places – a bar, a dance floor, a buffet, social space, bathrooms, but give them a twisted edge. Here are some tips for decorating a killer Halloween party or event, and where to find the supplies. 1. Decorating a Halloween Bar. Mad science just works in the bar. Set up black lights or black light spotlights around your bar area. Stock up on tonic water. Tonic water contains quinine which is naturally black light responsive. So gin and tonic is going to glow like radioactive spider venom. Add some small bits of dry ice to get it fully foamy. Brown liquors and wine can be dyed red with food coloring to look like blood. Add vintage labels for effect. Serve drinks in laboratory glassware. Spice up the booze bottle collection by adding assorted specimen jars. Oh and one more thing Skull Beer Bong! All the best Halloween parties have a dance floor. The biggest thing you’ll need is just a large space where people can dance without running into things. That leaves props for either high above them, or on stage. For hanging props nothing is more impressive than a hanging skeleton cage or gibbet, especially hung from a lamp as a chandelier or in the cross beams of some spotlights. Either way your going to get great creepy shadows. BJ Winslow.com in Los Angeles rents gibbets that are life size but made of light weight plastic that can be hung anywhere. For the stage a great backdrop can really set the mood. The backdrop should be large and colorful enough to stand out. If your performer is a DJ or keyboardist, a casket is a great prop to set up their turntable or keyboard in. Smoke machines are important to dance floors year round. For added creepiness, try getting your fog cold so it clings to the floor like cemetery mist. Avoid low lying fog machines with small chill chambers. The best fog chillers have a refrigerator cooling element built in. A budget version is to feed the fog machine into a cooler filled with ice or dry ice and a small fan to push it along. Great Halloween buffets make people think twice about eating the meat. Try setting up your kitchen as a Cannibals Meat Locker and mix severed heads and skinned bodies in with your cold cuts and melon balls. Autopsy bodies make great cake pans Drizzle deserts with delicious Butterscotch blood Shape both deserts and dips into human organs with Body part molds After all, you are what you eat! For snacks, use leech jars as cookie jars. 4. Halloween Party Social Space. Nothing helps people relax more than torture gear. Get a couple of electric chairs set up for people to sit in, maybe a stocks, and plenty of safety weapons so people can wail on each other while they chat. Plant a few decoy corpses in the space to encourage people to congregate there. People can also sit on autopsy tables, wheelchairs and hospital beds, but not caskets. Casket lids aren’t designed to take the weight and will break. Where there’s smoke there’s fire, and where there’s fire, theirs Hell. Make the smokers lounge a lair of fire and brimstone with smoke machines, candles, and randomly flickering orange and red lights Add some devil props and your Halloween Party is smokin’! Bathrooms are fun because they’re an opportunity to get people alone, so a nice horrific scare can be really effective here. They’re also great because glass, tile, and porcelain surfaces are hard to stain, so get as bloody as you want. Dry ice is activated by water, so try hiding some in the toilet reservoir.